Sometimes our hands and eyes coordination are just not in sync. I have accidentally deleted files and pictures on my computer many times and of course, I still do. Just recently, importing pictures from my camera, I must of selected not to save the files (again) when the dialog box appeared. I was rushing (again) so I thought the dialog box asked if I wanted to delete the pictures from my camera and I hit the 'yes' button. I then checked my camera, and my happy hands went on to delete all pictures stored in my camera. That was a huge mistake. Lesson learned: Always make sure the pictures from the camera are imported onto the computer before deleting anything on the camera. 1) Go to Recuva and download their free software. There are three options: one free and two paid versions. I chose the free and standard version and downloaded from Piriform. 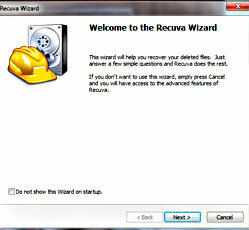 2) After installation, follow the Recuva Wizard to recover your deleted photos. Before proceeding to Recuva Wizard, remember to connect your camera USB cable to the computer, exactly how you would do it when you import pictures from your camera to the computer. Turn on your camera. 3) Select 'Pictures' for File Type. 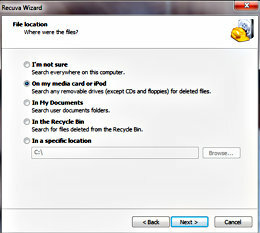 4) Select 'On my media card or iPod' for File Location. If you didn't connect your camera USB cable to the computer, you will get an error message "no file found'. You can connect your camera USB cable at this point if you forgot to do so and hit the 'next' button. 5) After Recuva retrieves your deleted pictures, select the ones you want to recover by checking in the box below the picture and then hit the 'Recover' on the bottom right corner of the screen. 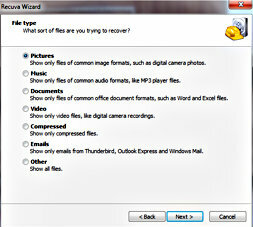 6) When your recovered pictures appear, choose where you want to save them. That's it! 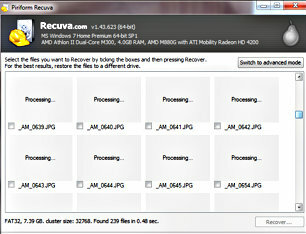 I hope you can successfully recover your deleted digital camera pictures using Recuva.